Some of the most dramatic landscape photos are those taken in the mountains. Since the majority of the population has never hiked or climbed to an actual mountaintop, those views are often the most compelling. If you are actually planning such a climb, you want to bring back the best images possible to actually portray the wonders you experienced. 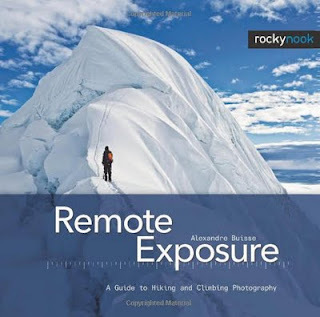 Shooting from mountaintops is considerably different than shooting in Cleveland or most anywhere else you probably live, and that’s why Alexandre Buisse wrote this book, Remote Exposure – a guide to hiking and climbing photography. It’s a great compendium of all sorts of practical advice in selecting what to bring and how to use it to its best advantage. First Buisse describes the equipment needed and how to carry it (dropping equipment on a mountain side is usually disastrous.) Then he gives some great tips about avoiding condensation and dust on your LCD. I never realized that I could help avoid dust on my LCD by making sure the camera was turned off when changing lenses. Turns out that reduces static electricity, which creates the magnetic attraction of dust to the LCD itself. An entire chapter is devoted to the “art” of composition because lots of uninteresting shots are never the measure of success. He then goes into the differences to be aware of in camping, hiking, technical climbing and mountaineering. A discussion of panoramic images, HDR and DSLR video rounds out the book. This is one where just about anyone is bound to find some tips they hadn’t known or perhaps reminded about ones they’ve long forgotten. It’s available at Borders and Amazon . The book is beautifully hardbound with a lay-flat design and is also available for the Kindle.